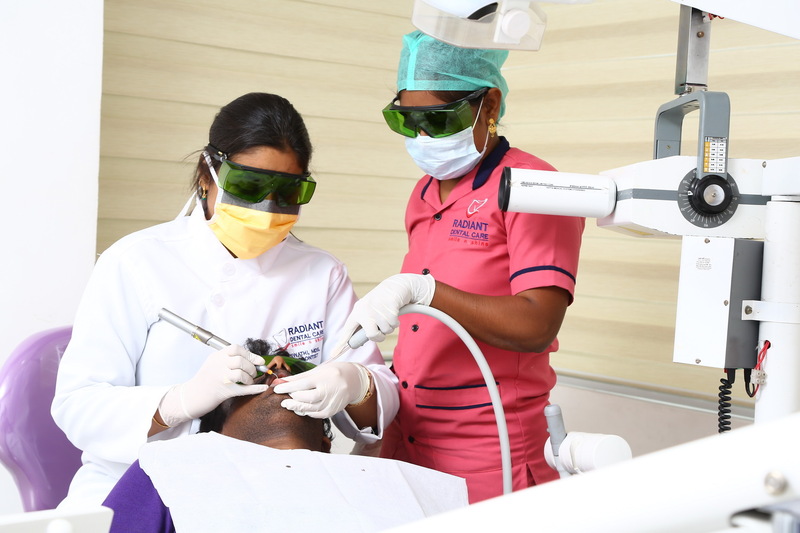 All dental treatment requires a constant contact with saliva and blood, the most prominent factor of transferring communicable disease and illnesses. We at radiant Dental Care put a great emphasis of minimising the contact as little as possible by following our highly planned hygiene procedure. All our patient are asked to cover their foot with our specially provided shoe cover before entering the clinic. Followed by cleaning with an ultrasonic cleaner along with a 5% dodecyl-di propylene-triamine & trialkyl ethoxy-ammonium-proclinate solution. The cleaner is charged ultrasonic waves that charge its frequencies according to the type of instrument. The pouches are then kept inside the autoclave for an effective sterilisation. A regular clinical audit ensures if all proper hygienic protocol is maintained or not.